Since Batman Begins the prequel has become big business and the origins of characters and their situations (already part of the public consciousness) leaves it wide open for moviemakers to run wild with new ideas of an old theme. Gene Roddenberry’s Star Trek has come a long way since its mid-‘60s TV days with Capt. Kirk (William Shatner), Mr. Spock (Leonard Nimoy) and the other crew members of the starship Enterprise, “going boldly where no man has gone before”. Around ten film versions have seen the light, always popular with those damn Trekkies, but not always critically up to snuff. This movie however outdoes pretty much all of its predecessors, including the deliciously camp TV series (although one cannot compare hundreds of millions of dollars on a single project with the low budget immortal charm and tacky flair of the original shows). The viewer is introduced to the lead characters, pretty much from birth, Kirk and Spock naturally getting more coverage than Uhura, Scotty, Bones, Sulu and Chekov. Kirk is the rambunctious upstart who is encouraged by a starship commander friend of his late father to join the Star Fleet. Spock is of human and Vulcan descent, a race whose dedication to logic and suppression of emotion is a perfect counterpoint for Kirk who flies at the seat of his pants and burn on impulse. From their first encounter they lock horns. Our group of rookies has to ship out when a crisis looms. The Romulan rogue Nero has vengeance in mind, aiming to destroy Spock’s planet, and a time-flipping plot unfolds. 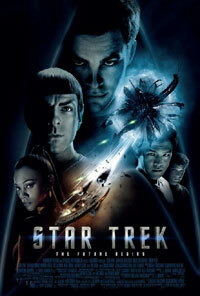 With some amazing visual effects, an exciting pace and pulse-racing action, this Star Trek movie is obviously the start of a whole new franchise (just like Batman), and serves up an entertaining ride for a very wide age group. PS. Interesting how everyone in the universe has American accents (even the Australian bad guys). Extra DVD features include an interesting look at the re-invention of this legendary series and a gag-reel (which is usually pretty lame). For more in-depth info you can check out the commentary track with the director, excutive producer and writers.